The price of carrots at Fred Meyer this week: whole carrots in a 5-lb bag for $3.49 or 69 cents/lb, or cut and peeled baby carrots in a 3-lb bag also for $3.49 or $1.16/lb. Basically, if you buy the whole carrots at Fred Meyer this week, you get 2 additional pounds of carrots when compared to the baby carrots. Here's how I buy carrots -- 10 lb bags of whole carrots at Smart Food Service/Cash & Carry (a wholesaler open to the public with prices similar to club warehouses). I enjoy the ease of baby carrots. However, the cost (at almost twice the price of whole carrots) is beyond a small budget. Granted, there is some waste when peeling and trimming the ends from whole carrots. I give a generous estimate to the waste at about 1/10th to 1/15th of the weight of a whole carrot; still not enough to justify the purchase of baby carrots for me. So, what do I do to make whole carrots more accessible for all of our family members and without a large time investment on my part? 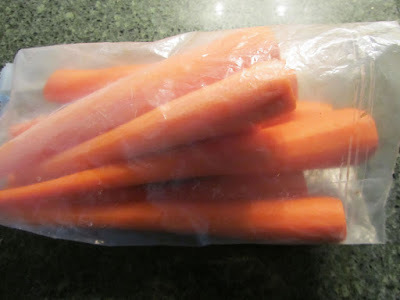 I take about a dozen carrots at a time and peel and trim, then place them in a plastic bag in the fridge. Family members are then free to cut into sticks, chunks, slices, or eat whole. (We've all been sporting the Bugs Bunny look in recent weeks, chomping on whole carrots.) If I had small children who were not adept at using sharp knives, obviously I'd cut carrots into sticks for them. I have to say, this is really working for me. When I see that the bag of ready-carrots is near empty, I take about 5 or so minutes to peel and trim a dozen. 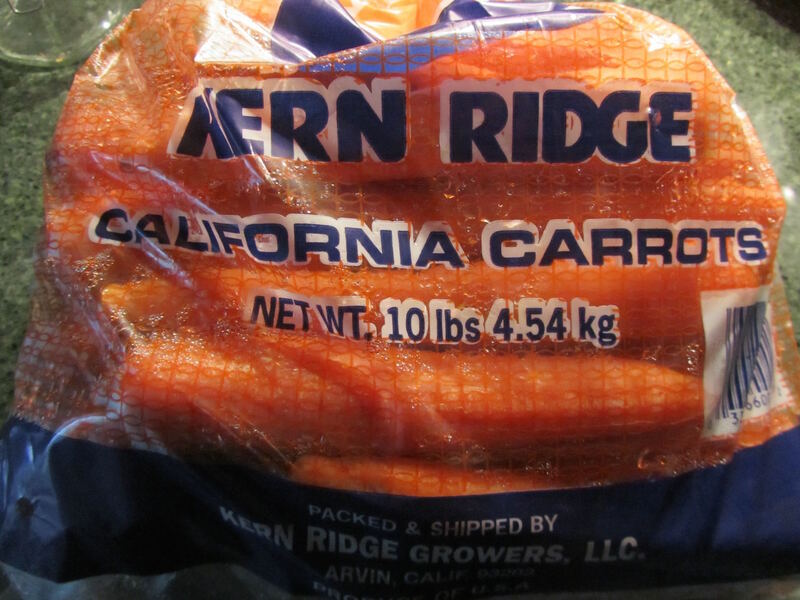 There are about 3 to 4 dozen carrots in a 10-lb bag. In total, I spend about 20 to 30 minutes peeling and trimming a full bag of carrots. I save about $3.70 to $3.80 per 10-lb bag of carrots when I peel and trim them myself (this includes the waste of the peels and ends). That's a savings of $3.70 to $3.80 for 30 minutes of hands-on time, or an "hourly wage" of $7.40 to $7.60. There's an added financial bonus to making our whole carrots more user friendly -- members of our household are much more likely to grab a carrot (which is an inexpensive veggie) than some frozen peas or green beans (which are at least double the cost of carrots) for their lunches. This concept of buying carrots in a basic and whole state, then transforming them into something more user-friendly offers substantial savings for other commonly-bought vegetables. Compare the price of whole potatoes to frozen French fries. Whole potatoes can be made into oven fries fairly easily and replace the commercially-prepared frozen French fries at a fraction of the cost. Bagged whole potatoes are currently selling for about $2 per 10-lb bag in my area. Frozen French fries sell for about $1.99/32-oz bag at Fred Meyer. Including oil, salt, and electricity for the oven, oven fries made from whole potatoes cost no more than 30 cents per pound. That's less than 1/3 the cost of the prepared potato product. Look at the cost of bagged lettuce. An average head of Romaine lettuce weighs between 21 and 22 ounces. At Fred Meyer this week, a plain, unpackaged full head of Romaine lettuce is selling for $1.79. So, what about the waste when washing and trimming a whole head of Romaine lettuce? I would give a guess at about 1 ounce per head. (BTW, I use a good portion of the core when making salads, by slicing thin and cutting into matchsticks, as I described in this post.) So, after the loss of 1 ounce, a head of Romaine costs between $1.36 and $1.43 per pound. This week, the Kroger brand of bagged leafy Romaine lettuce is selling for $2.79 for a 10-oz bag, and the Dole brand of bagged, chopped Romaine is marked at $4.99 for a 32-oz bag. The Kroger bagged lettuce is $4.46 per pound and the Dole bagged Romaine is $2.49 per pound. The Kroger lettuce is about 3 times the cost per pound of a basic head of Romaine! While the Dole bagged Romaine, while much cheaper than the Kroger, is still almost twice the cost per pound of the basic, unprepared head of Romaine. I do sometimes find bagged salad on markdown. However, the 10-oz bagged Kroger Romaine lettuce would need to be marked down to 85 to 89 cents to break even with the full head price, and the bagged Dole Romaine marked down to about $2.72 to $2.86 per 32-oz bag. So far, the lowest price I have ever seen short-dated Kroger 10-oz bags is 99 cents. Even after markdown, a full head of lettuce is still less expensive per pound than the bagged. Washing a head of lettuce probably takes about 10 minutes of hands-on time. I can fill my large sink with water, peel the Romaine leaves off one at a time and add to the water, swish them all around gently, then drain well. When I wash lettuce to store in the fridge, I wrap the washed leaves in a large, but very thin, cotton dish towel, then I place the bundle in a plastic bag. Lettuce stored this way will keep in the fridge for 7 to 10 days. Pre-chopping the lettuce will shorten the storage life, so I generally leave the chopping to the last minute. It's the washing and drying that seems to take time. There is definitely a place and time for convenience produce items. They can save money if the alternative is a restaurant or even an inexpensive take-out meal. The time-savings could be more valuable than the financial savings in some circumstances. But for my small grocery budget, I can buy more wholesome, quality foods for my family by doing the prep work myself. I think whole carrots taste better than baby carrots, so that's another bonus. I do sometimes buy baby carrots if they are on sale at Aldi--as you said, sometimes convenience is a wonderful thing. I almost never buy frozen potato products--maybe once or twice a year--I think once you get into the groove of cutting up your veggies, it really isn't a big deal. 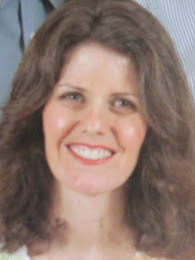 I may change my mind when we are empty nesters, though! I think the whole carrots taste better, too. However, my husband prefers the convenience of the baby carrots, so when he's buying, he goes for the baby carrots. Sometimes you can get them for 50 cents/lb although recently, they have been a little more than that. And as Lili pointed out, cut lettuce doesn't last as long, so I avoid bag salads that have cut leaves. We don't always eat lettuce quickly here. I think you're right about getting into the habit of cutting up veggies. One you're doing it, it really isn't that big of a deal. For the taste, I think the baby carrots can be milder than some large carrots, but I'm fine with either. Not sure if I am able to reply. My last few replies vanished in cyberspace. Just wanted to say, I still read all your posts. Good job on everything you do. You are an inspiration. Like you, I figure things out exhaustively, because though it may seem pennies, spending and consumption is continuous and nonstop. That's when the pennies add up. We're not talking a one off event. Oh gosh, sorry about the commenting issue, YHF. I wish I knew what to do to fix it. You're right, all those pennies add up to dollars. For me, right now, a few extra dollars in a month means more quality foods for my family. Carrots!! One of our family favorites. Dad grows a lot in the summer and so we freeze and use those for cooking only. Last years crop was a bust so we ended up having to buy carrots. I prefer the large whole carrots and will cut those as desired. Last week we had a coupon for the baby carrots so we bought a big bag of those. The one thing is that they are always moist almost slimy in the bag. They are not rotted but they must put something on the carrots before bagging them. That is kind of gross to me although they are not slimy and do taste good. So my biggest problem right now is that buying a big bag of carrots and even lettuce tends to go bad before we can use it all. I guess that means we don't eat enough fresh veggies! I had to clean up a bunch of carrots that were about to turn bad and a couple of lengths of romaine lettuce. I saved them but I probably should push more fresh veggies but I'm on low-spend year. We are mostly eating frozen cabbage, frozen green beans and other veggies from the freezer. Alice, I have also noticed the damp baby carrots, especially when I buy them from Aldi. I have found that snipping a tiny corner off of the bag and draining them prior to storing them in the fridge seems to work and the carrots don't dry out (but we do tend to eat them within a 2 week period!). I thought the slimy surface of the baby carrots was just us not using them soon enough. Interesting that you, both, have seen the same thing. Good idea to cut open the bag just a bit, for better air circulation and drainage. Having grown up with a garden in my parent's home, my immediate image of a baby carrot is of the thin, sweet thinnings that were culled out of the carrot patch. THOSE are baby carrots. For 10-20? years now, "baby carrots" have been the vogue. As other's mention, they are coated in something, which turns white, slimy and smells off to me. Unless a freebie as a loss leader, they don't enter my home. I have always purchased full sized carrots, even with a family unit of 3 adults at home, I tend to buy 5 lb bags at a time for the best price, usually $1.99-$2.99 so 40 to 60 cents/lb. I only ever scrub and never peel them, the vitamins and fiber are lost when you do. : ) Great post. I know. Real baby carrots are something else. And real baby carrots are hard to find in markets. When I have seen them, they are pricey. I sometimes just scrub. It depends on how much time I have. 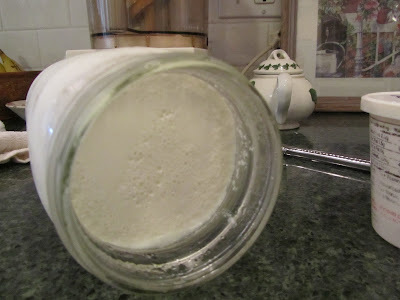 I'm pretty fast with the peeler but often very picky when it comes to the scrubbing, so it takes longer.